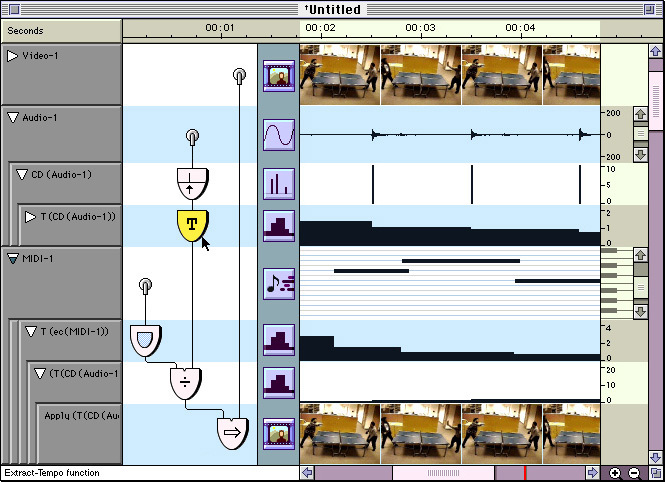 MediaCalc was an experimental authoring system for interactive media in which content annotations of time-based media could be operated on by functional dependencies in order to compute new media. I contributed to its interface design and interaction design from 1994-1997. MediaCalc sought to combine capabilities of modern media editing systems with an insight of spreadsheets: when we can describe a model in terms of functional relationships, we can describe computations so simply that they are much more tractable than programming in general - potentially even for non-programmers. Functions are applied to media via a visual programming model in which function icons are dragged from a palette onto media handles and thereby connected into a network of dependencies. Constraints among media streams, and among abstract streams of different types describing the "contents" of other streams, form a language for prototyping and creating media and software artifacts.